The Air Force’s top officer and enlisted leader hosted a town hall forum in the Boyd Auditorium at Maxwell Air Force Base, Ala., July 20, 2016. During the 70-minute forum, Air Force Chief of Staff Gen. David L. Goldfein and Chief Master Sgt. of the Air Force James A. Cody answered several questions from the crowd and addressed their key concerns. One concern weighing on many Airmen’s minds was the recent Senate proposal to overhaul basic allowance for housing. An Airman from Maxwell Air Force Base, Ala., asks Air Force Chief of Staff Gen. David L. Goldfein and Chief Master Sgt. of the Air Force James A. Cody a question during a town hall event July 20, 2016. 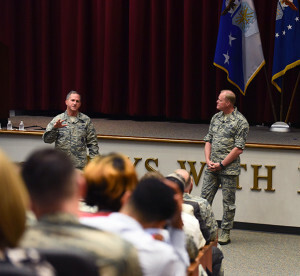 The Air Force’s two most senior leaders answered multiple questions from the audience, addressing the Airmen’s concerns. A range of questions were asked on various aspects of the Air Force, from leadership and command and control, to on-base housing and warfighting. One question allowed Goldfein to state his vision for the Air Force. “I look at the global landscape and the building of joint task forces that operate trans-regionally across geographic combatant commands … what I see is an Air Force that is equally capable of supporting or being supported in the business of joint-combined arms warfare in the future,” Goldfein said. Concluding the town hall, Goldfein left the audience with one final thought.